In 2004 Bye-Tiller got the Jury Award at the Northern Norway Art Exhibition (Nordnorsken), with a painting based on photography. 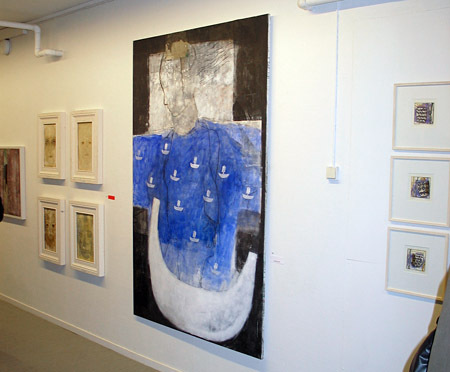 The exhibition toured the counties of Nordland, Troms and Finnmark in Norway. "Bye-Tiller’s painting «Woman under sail» displays a sort of dreamlike fantasy world that also has its origin in a perception of the outside world, specifically sailing, which is all about being in a boat, outside of it, seeing boats at a distance, dedicating oneself to water as an element as the sea unfolds like an woman’s open embrace in the form of the swaying silhouette of a boat." By art historian Olga Schmedling (Jury). – «Woman under sail» can be interpreted as my tribute to strong female personalities. The main figure in the image is the Icelandic woman named Gudrid Thorbjarnardottir who lived 1,000 years ago. The work is also a symbol of the human ability to undertake journeys, allowing oneself to be carried along with the current, being in constant motion. The advantage of being able to relocate onself is having the opportunity to see things from a new perspective, says Bye-Tiller.